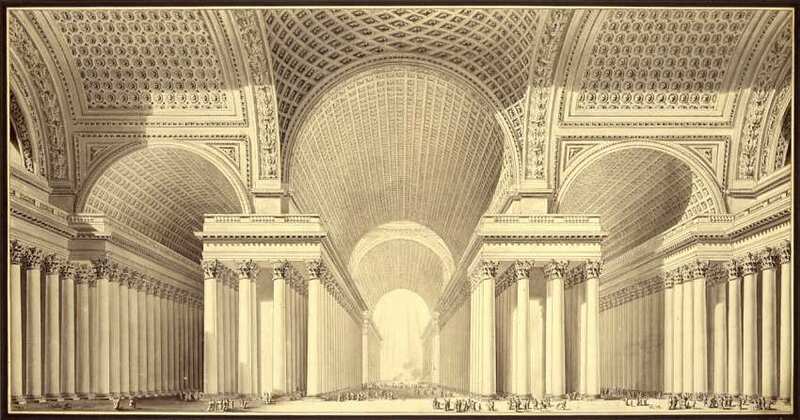 Born in Paris, he studied under Jacques-François Blondel, Germain Boffrand and Jean-Laurent Le Geay, from whom he learned the mainstream French Classical architecture in the 17th and 18th century and the Neoclassicism that evolved after the mid century. He was elected to the Académie Royale d’Architecture in 1762 and became chief architect to Frederick II of Prussia, a largely honorary title. He designed a number of private houses from 1762 to 1778, though most of these no longer exist; notable survivors include the Hôtel Alexandre and Hôtel de Brunoy, both in Paris. 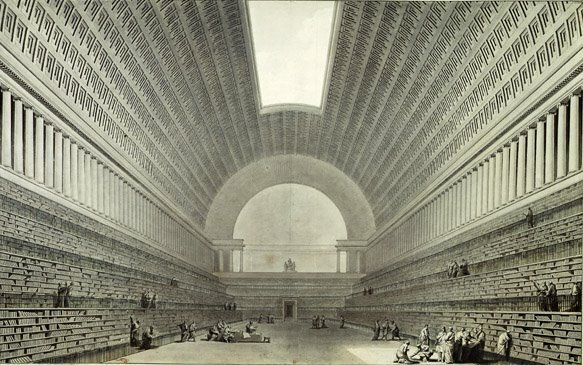 Together with Claude Nicolas Ledoux he was one of the most influential figures of French neoclassical architecture. 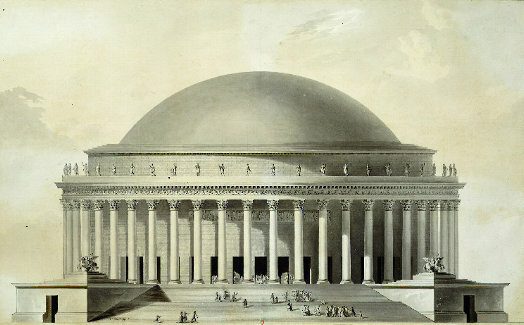 Boullée promoted the idea of making architecture expressive of its purpose, a doctrine that his detractors termed architecture parlante (“talking architecture”), which was an essential element in Beaux-Arts architectural training in the later 19th century. 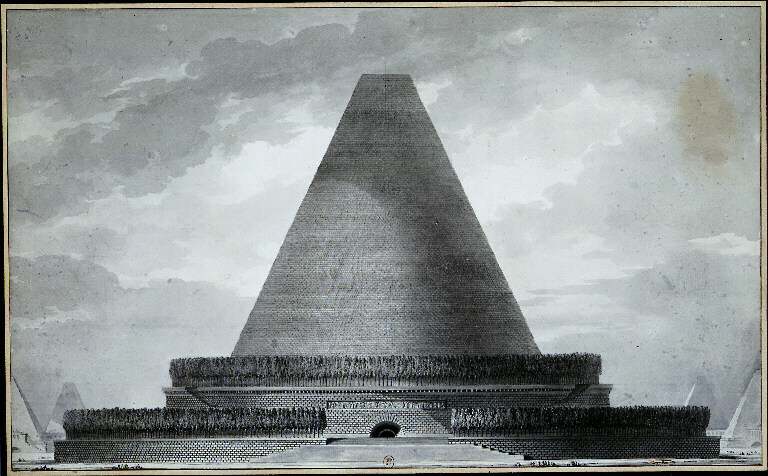 His style was most notably exemplified in his proposal for a cenotaph for the English scientist Isaac Newton, which would have taken the form of a sphere 150 m (490 ft) high embedded in a circular base topped with cypress trees. 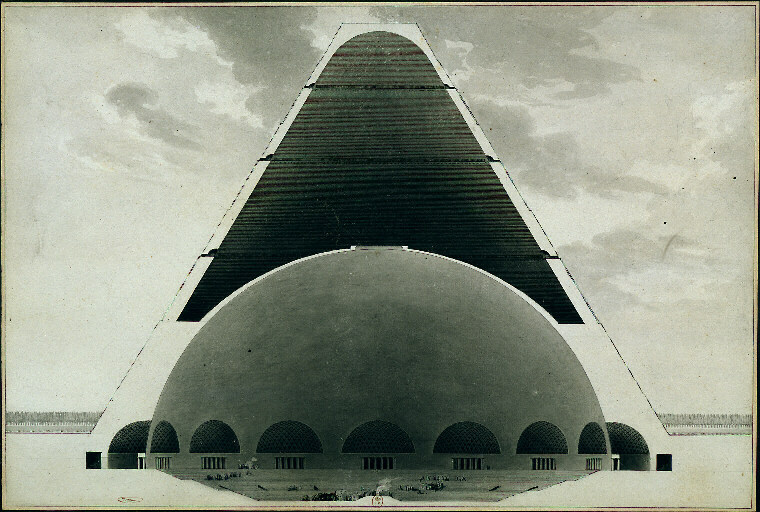 Though the structure was never built, its design was engraved and circulated widely in professional circles. Designed in 1784, for all its apparent originality, it actually derives from contemporary archaeology. 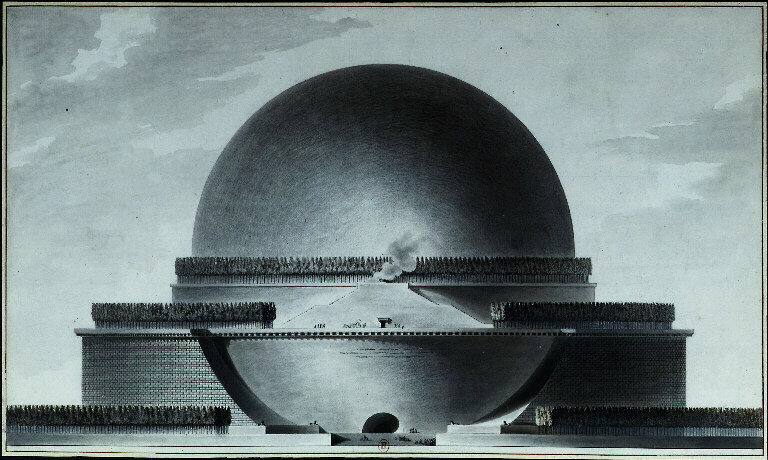 The small sarcophagus for Newton is placed at the lower pole of the sphere. The design of the memorial creates the effect of day and night. The effect by night, when the sarcophagus is illuminated by the starlight coming through the holes in the vaulting. The effect by day is an armillary sphere hanging in the center that gives off a mysterious glow. For Boullée symmetry and variety were the golden rules of architecture. Boullée’s fondness for grandiose designs has caused him to be characterized as both a megalomaniac and a visionary. His focus on polarity (offsetting opposite design elements) and the use of light and shadow was highly innovative, and continues to influence architects to this day. 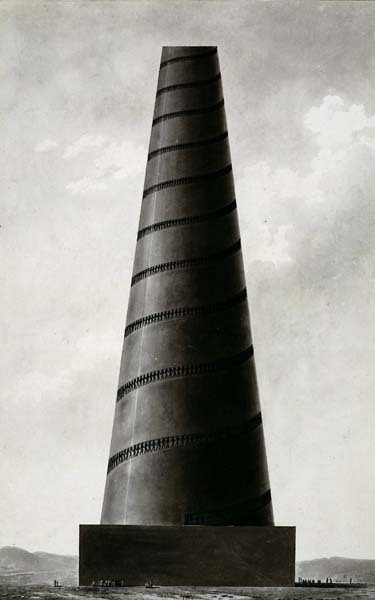 He was “rediscovered” in the 20th century and has influenced recent architects such as Aldo Rossi. 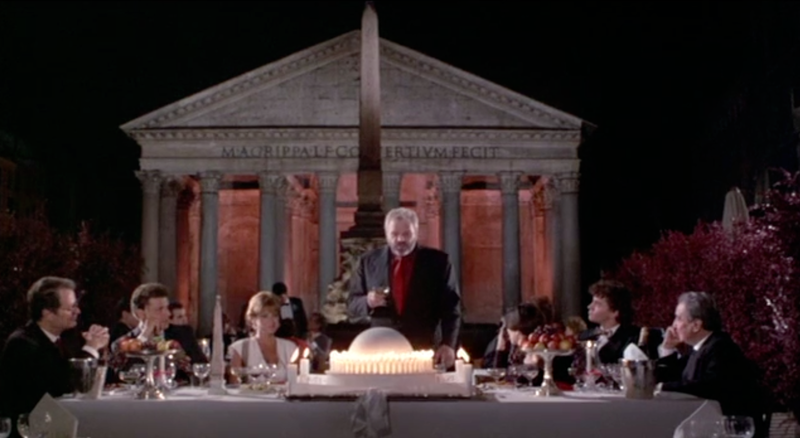 In Peter Greenaway’s 1987 film The Belly of an Architect, the main character Stourley Krackite is not only obsessed with celebrating an architect (Etienne-Louis Boullee) who never finished a building, but he is also consumed with representations of the body part whose rebellion will lead to his eventual demise: his belly. 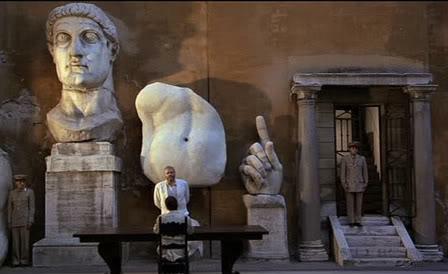 Kracklite photocopies the stomachs of representations of architectural greats (the emperor Hadrian, Boullee) and draws his ailments in order to illustrate his pain for his doctors. Kracklite’s fascination with Boullee seems appropriate in that it mirrors his own creative impotence; in the scene in which Kracklite catches Caspasian in the act with his wife, one cannot tell if he is enraged because his conjugal property is being stolen, or because Caspasian is using his model of a Boullee lighthouse as an enlarged surrogate phallus. Étienne-Louis Boullée (París, 12 de febrero de 1728 – id. 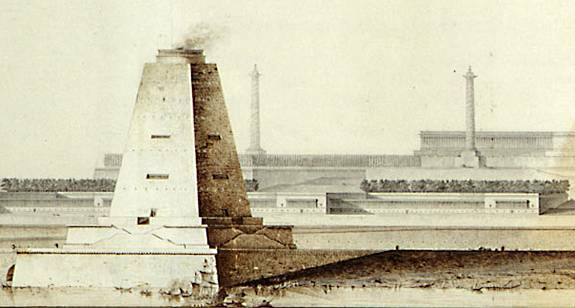 4 de febrero de 1799) fue un visionario arquitecto francés del neoclasicismo, cuya obra influyó mucho en los arquitectos contemporáneos y aún hoy en día es considerada importante.Boullée promovió la idea de hacer arquitectura expresiva de su propósito, una doctrina que sus detractores llamaron architecture parlante («arquitectura parlante»).